RIO DE JANEIRO – With less than a month to go until Carnival, all the samba schools are preparing for the climactic Sambodrome competition, including Unidos do Viradouro, the red and white Gremio (school) from Niterói, the satellite city on the other side of the Guanabara bay. 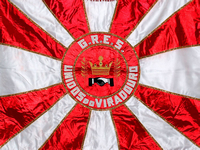 The official flag of Unidos do Viradouro, photo by Henrique Matos/Wikimedia Creative Commons License. Carnival technical rehearsals continue heating up samba fans during the weekends, and last Sunday, Unidos do Viradouro entered the catwalk, looking ready to put on a great show on February 14th. Along with Unidos do Viradouro, Grande Rio and União da Ilha had a chance to practice their routines on the Avenida Sapocai. The pounding rhythm and flashing bodies of the passistas (samba dancers) attract an audience that can’t wait for Carnival to come, such as Raimundo Nonato, a contractor from the Cidade Maravilhosa. Mr. Nonato exclaims, “I wait all year long for the Sambodrome nights and when rehearsals begin I start literally fibrillating”. Unidos do Viradouro is a Gremio, like its competitor Porto da Pedra is from just across the Guanabara bay. However, the Samba School from Niteroi has been competing since 1986 in Rio de Janeiro’s carnival contest, and is established as one of the most traditional samba institutions in the country. Unidos do Viradouro was founded in 1946 by a small group of samba players in Niteroi, and its symbol is an interracial hand shake. Before moving to Rio’s Carioca league the school won its local competition 17 times. In 2007 when Viradouro was parading with the theme “É de arrepiar” (It makes you shiver), the school brought to the Sapocai Avenue a real portable ski track with actual skiers going down hill, all that, in the Carioca mid-summer night. Unidos do Viradouro using their imagination, photo by Lalo de Almeida/ Wikimedia Creative Commons License. This year the red and white samba school will be parading by the theme “Brasil de todos os deuses” (Brazil of all gods), a representation of some of the main religious groups that color this enchanted country: from Christianity to Candomblé, an Afro-Brazilian religion. Viradouro’s rehearsals are at the school facility in Barreto, a neighborhood of Niterói. They take place on Saturday nights, starting at 10PM. Entrance is R$10 for gentlemen, and R$5 for ladies. To get to Viradouro’s quadra (dance hall), take a ferry from Praça XV to Niterói. Once you get there, it’s just a short taxi ride to Barreto.